W. V. Meyer is with the Ohio Aerospace Institute, NASA Lewis Research Center, 21000 Brookpark Road, M/S 105-1, Cleveland, Ohio 44135-3191. A. E. Smart’s permanent address is 2857 Europa Drive, Costa Mesa, California 92626-3525.
the Department of Electrical and Electronic Engineering, University of Nottingham, University Park, Nottingham NG7 2RD, UK. M. A. Anisimov is with the Institute for Physical Science and Technology, University of Maryland, College Park, Maryland 20742. 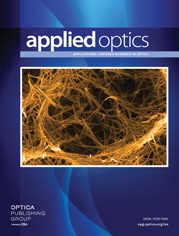 This feature issue of Applied Optics contains 25 research papers on photon correlation and scattering. Many of the papers in this volume were presented at an OSA Topical Meeting that was held 21–24 August 1996 in Capri, Italy. The focus of these papers is research in dynamic light scattering, surface light scattering, photon correlation, laser velocimetry, and their applications to biological, chemical, and physical processes.